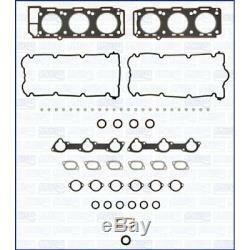 AJUSA Gasket Set, cylinder head FIBERMAX 52161000. 1x AJUSA Gasket Set, cylinder head FIBERMAX 52161000. 2959 ccm, 162 KW, 220 PS. 2959 ccm, 160 KW, 218 PS. 2959 ccm, 166 KW, 226 PS. 2959 ccm, 158 KW, 215 PS. 3179 ccm, 169 KW, 230 PS. 3179 ccm, 184 KW, 250 PS. 3179 ccm, 176 KW, 240 PS. IMPORTANT NOTICE ABOUT PART FITMENT TO VEHICLE. Cars have different modifications and options, even if your model is mentioned in listing it does not guarantee that the item will fit your car 100% and therefore YOU ALSO NEED TO MAKE SURE THAT ORIGINAL PART NUMBER FOR NEEDED PART IS MENTIONED IN LISTING ITEM SPECIFICS SECTION. If you can not find part you need, please send your car VIN (chassis number) and indicate what you need and we will send you link to listing where need spare part is. If needed part is not yet listed, we can activate listing with needed part in case if we can provide it. We sell only new original (genuine) and aftermarket parts, therefore if you search for discontinued car parts from very old or very exotic cars, we will not help you. The item "AJUSA Gasket Set, cylinder head FIBERMAX 52161000" is in sale since Wednesday, September 27, 2017. This item is in the category "Auto & Motorrad\ Teile\Auto-Ersatz- & -Reparaturteile\Motoren & Motorenteile\Dichtungen & Ringe".eu" and is located in RIGA.